Sometimes being on a budget isn’t so bad. Cutting out certain things can allow for other aspects to be bumped up a notch or two while still being thrifty. Rather than going out to dinner and a movie on a regular basis, we stay in with a delightful bottle and some Netflix action. So when my fiancé and I found ourselves in the wine shop on the weekend, we decided to look for a respectable wine because we knew we were staying in. We had a Sean Connery James Bond lined up on the Netflix, so we were looking for something that was a little bit dashing, bold and elegant. 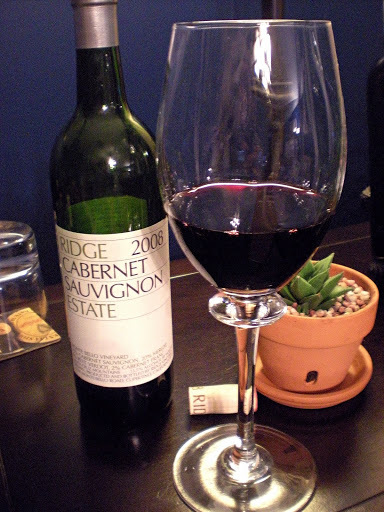 My fiancé chose the Ridge ‘Estate’ Cabernet Sauvignon 2008. The label is rather masculine looking and more than likely not one that I would have picked up. 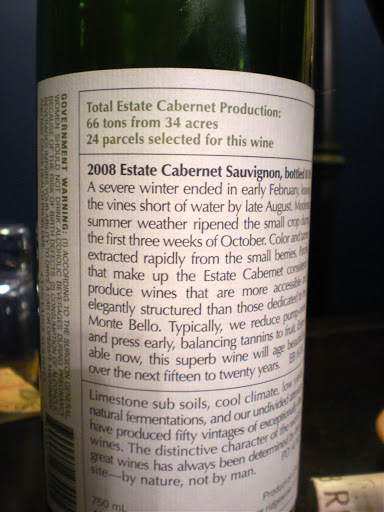 However the back label was filled with a plethora of fascinating data regarding the production of the wine; from the acreage and weather info to cellaring details [the wine is superb now, but will age beautifully over the next 15-20 years].